A clogged drain can slow you down, and cause major issues if it’s not repaired. Harsh chemicals can do more harm than good, so, what do you do? Take advantage of our drain clearing special. Look to Abbott’s Plumbing to respond fast and fix your slow or clogged drain. And, we’ll do a free camera inspection of your main line with every job. This offer cannot be combined with other coupons and applies to residential owner-occupied homes within our service area only. Special price is a “per clog” rate and toilet removal (if necessary) is not included. The special price is good for lines with an accessible cleanout outside of the home only – 75 ft. maximum cable length. This price includes two passes through sewer lines 4” or less (In & out of the line twice). 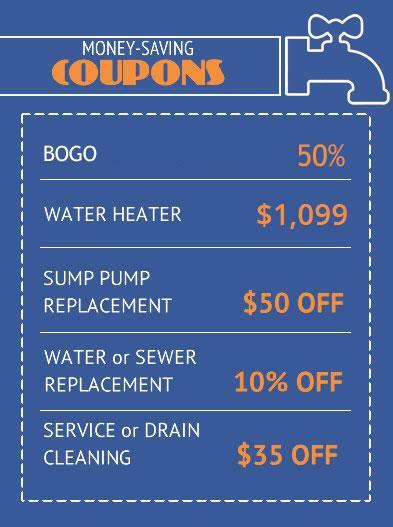 This special price applies to main sewer lines only (not area drains, patio drains, deck drains, pool drains, roof drains, yard drains or rain gutters). Any repairs that may be needed can be completed at an additional cost.